When you need to convert PDF to word, there are a few software for you to choose on VeryPDF website. I will try to compare them here then you can try to find the proper one for you. As when you choose software, you need to take functions, price, and others into consideration. This software can convert text based PDF to word and it also can be used either as command line version converter and GUI version converter. And this is the only command line version converter of PDF to word. It nearly supports all the language PDF file but PDF should be text based. 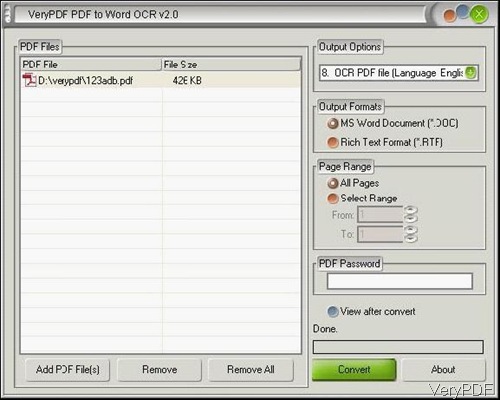 When you need to convert image based PDF, please choose converter with OCR function. 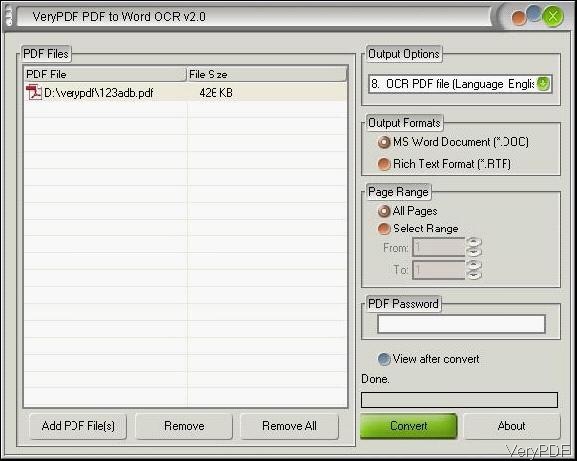 Compared with PDF to Word Converter 3.1, this software has OCR function which can be used to convert image PDF to word. Meanwhile this software also can be used to convert normal text based PDF to word easily. When converting image PDF to word, this software only supports a few languages: English,French,German,Italian,Spanish, Portuguese. This software also can convert password protected PDF to word. Compare with above this software, this software supports more input formats. Support input formats: PDF, TIFF, JPG, PNG, BMP, TGA, PCX, EMF, WMF and PNM, which means this software can export content from image and PDF directly to editable word documents by OCR function. Scan to Word OCR Converter can recognize six kinds of languages, including English, French, German, Italian, Spanish and Portuguese. By this software, convert PDF to word is just one of its part functions. This software also can be used to convert PDF to Word, Excel, PowerPoint, HTML, XML, PostScript, EPS, plain text and image, like TIFF, JPEG, TGA, PNG, GIF, BMP, and PNM (PPM, PBM, and PPM). But this software does not have OCR function, which means it can not convert image PDF to word. Another benefit of this software is that there is also Mac of PDF to Any Converter available here. If you are Mac user and need to convert PDF to word, you can have a free trial of this software. By this software, you can extract content from PDF document with OCR function. So it can convert normal PDF and image PDF to word easily. And by it, you can only extract part of content of PDF file to word, also you can save it as CSV, XLS, XLSX, HTML, etc. file formats. There is also Mac version available here. Different with above software, this software is good at converting PDF to Excel. In anther word, it can extract table from PDF well. Please choose the proper one when you need to convert PDF to word. During the using, if you have any question, please contact us as soon as possible.